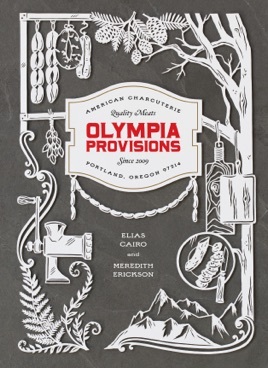 This book by Cairo (cofounder of Portland, Ore.'s Olympia Provisions) and food writer Erickson celebrates the art of charcuterie in a way that translates from art to plate. The first section covers charcuterie theory and technique, and a second has specific recipes from the restaurants covered in the book. Chapters on p t , sausage, smoking, and curing help readers develop their meat preparation skills. The recipes include a bratwurst gravy for brunch, apple and kielbasa strata for lunch, and salty-sweet salami rolled in chocolate, nuts, and spices for dinner. Chorizo, pancetta, k sekrainer, and pork liver mousse are just some of the examples of the global flavors. With all the different styles of charcuterie then applied to different meals of the day, this book serves as a great basis for anyone interested in learning how the sausages are made and how to expand his or her meat palate.